Anyway, while looking for photo stock recently I came across a few good gun pictures that are relevant to the science fiction genre. Normally sci-fi likes to present itself as using cutting edge technology or show what is only possible in the far future. Sometimes that technology is anything but “modern”, whatever that means. In a number of cyberpunk works crimes are solved by retrieving images from gun cameras and enhancing them on a computer etc. This is kind of a yawn plot device as if someone used the gun and knew it had a camera in it when they committed a crime, then the destruction of the gun and camera would be a priority, but I digress. Cyberpunk readers’ demand that technology be used extensively in stories and so what if the use is an unlikely one? I mean it is all SF isn’t it? 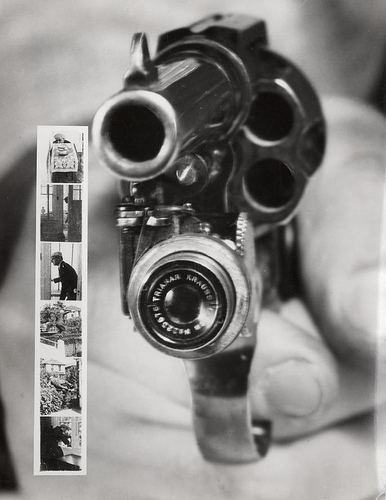 Well, unfortunately the “modern” technology of gun cameras is anything but, as this photo proves. In case you are wondering, the photo dates from 1938. There is a lesson here for any aspiring author and that is to truly do your research. If you wax lyrical about the “new technology” of gun camera’s in your stories then please make sure that it actually is new. If you aren’t sure or cannot find accurate information then at least talk about the “recently widely adopted technology of ‘X’ “, or similar phrases and then no matter how old it is no one will care. Lack of research and credibility is one thing that hampers science fiction as a genre. Make sure it doesn’t hamper you. This entry was posted in Science Fiction and tagged Author, Cyberpunk, Dave Felton, Gun Camera, Plot Device, Professional writer, Science Fiction, Writer. Bookmark the permalink.